SrI rAmAnuja accepting a dumb person as his Sishya and asking him to simply depend on his lotus feet. The continuation from the previous pAsuram and this one stems from an imaginary question that maNavALa mAmunigaL assumes SrI rAmAnuja poses him. In the previous pAsuram, maNavALa mAmunigaL requested SrI rAmAnuja to quickly find a way to destroy his body and take him to his fold. 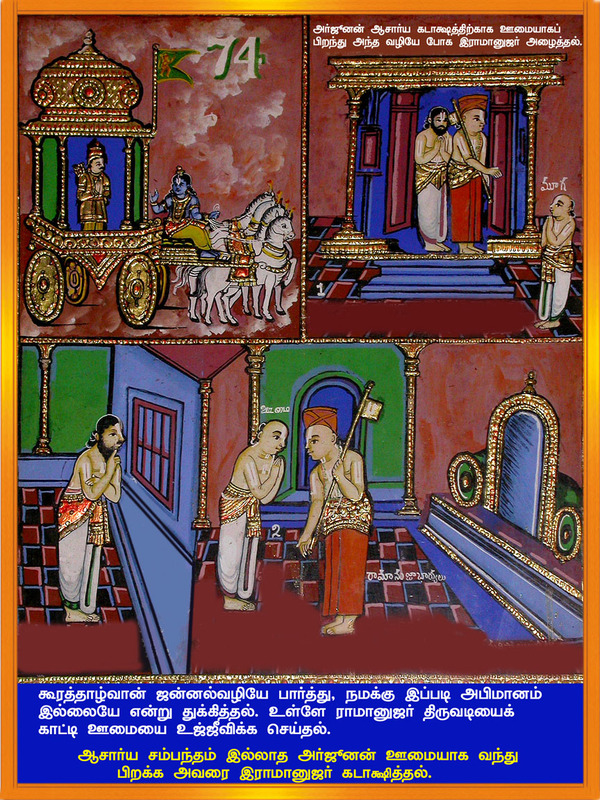 SrI rAmAnuja questions maNavALa mAmunigaL, “Well! Who am I to or what qualifications do I have to think about your faults and accept you? Were you a person who was not cognizance about what to do? Were you a person who could not do those tasks that you described, yourself? Can you not do these task of finishing your body yourself and thereby doing good for you, as you say”? maNavALa mAmunigaL reply is this pAsuram. He says that if an infant can do its tasks by itself, then adiyEn (I), your eternal child, can do tasks on my own. An infant does not know what to do and cannot do anything to protect itself. Similarly, adiyEn does not know what to do and how to do it. You, my mother will have to do that for me. unakku – to your ever growing resplendence? urai – Please tell me!!! maNavALa mAmunigaL gives an analogy of a mother who cures her child’s disease / infection by taking medicine and water appropriately. The child that is breastfeeding does not know anything to cure itself. It is only the mother who does everything on behalf of her child and cures the disease. Similarly, maNavALa mAmunigaL tells SrI rAmAnuja that the latter is his mother and that does it degrade his resplendence in any fashion, if he can do all the things on his (maNavALa mAmunigaL’s) behalf and eventually curing the disease. maNavALa mAmunigaL gives an analogy to start with. There is a mother who has a baby that is breastfeeding. A breastfeeding baby does not know anything and is completely dependent on its mother. If at all there is some kind of infection or disease for the baby, what would be the natural course of action? The mother would do everything that needs to be done in order for the disease to be cured of. This would include tasks like taking water that can be a medicine by itself. This can be taking appropriate water only so as to not jeopardize the effect of medicines that she had taken a while ago. Whatever the tasks is, it is she who does that on behalf of her child to make sure that the child is free of any disease. In fact, the mother would think that the child got the diseases in the first place because of her not taking care of the child properly. Similarly, maNavALa mAmunigaL tells SrI rAmAnuja that the latter is his mother who is depicted as a person of infinite vAthsalyam. maNavALa mAmunigaL asks Sri rAmAnuja, “Oh! yathirAja!!! Whatever is required by me to do, if you do that on behalf of me, will that represent any kind of a black mark on you? No. it will not. Instead, it will only add luster to your ever glowing resplendence. It is in fact very surprising that you have to release this message to the world via me. You know everything. Why don’t you tell this message to everyone? The reason maNavALa mAmunigaL says this is because of the message impregnated in our scriptures. One needs to remember the activities that an AchAryan (guru) does towards his Sishyan. There is something called “AchArya abhimAnam”. This is when one’s AchAryan picks a Sishya out of his love and does things for him. An AchAryan recognizes that the Sishyas is powerless and cannot do anything. The AchAryan realizes that the Sishya cannot do any anushtAnam on his own. On the other hand, the AchAryan also thinks about the fact that if SrIman nArAyaNan gets back one of is property (i.e the soul that is inside the Sishyas), then HIS face would become happy. So thinking about these two (Sishya and SrIman nArAyaNan), the AchAryan does all anushtAnams on behalf of his Sishya and makes the face of SrIman nArAyaNan resplendent with happiness. The act of an AchArya is akin to the mother who drinks medicines and water and cures her child’s disease. These AchAryas who are signified by extreme compassion to their Sishyas are living examples of who are known as “mahAbhAgvathas”. One needs to understand their greatness and should fall under its lotus feet and take whatever he does towards him. It may be taking away something or granting some other things. Whatever actions an AchArya does, a Sishyas should remain completely dependent on him, just like the child does towards its mother. This can be found in numerous places. “valla parisu varuvipparEl (nAchchiyAr thirumozhi 10.10)” is one of the many examples to this. This entry was posted in Arththi prabandham, Other on June 20, 2016 by santhanam rajagopalan.